Graduated from Matignon High School in Cambridge. Graduated from St. John Seminary in Brighton. Ordained a priest after earning a master's degree in sacramental theology. Received a master's degree in church history. Parochial vicar at St. Mary of the Nativity Church in Scituate. Parochial vicar at St. Mary Church in West Quincy. Archdiocesan assistant for canonical affairs. Named rector of St. John's Seminary. Ordained a bishop, charged with overseeing the western region of the Boston Archdiocese. Named apostolic administrator of the Archdiocese of Boston, upon the resignation of Cardinal Bernard F. Law. e was the quiet boy at St. James the Apostle grammar school. Richie Lennon's stutter was so bad that he rarely spoke in class, never raised his hand, always lived in fear of the humiliating silence and stares as he groped for words. It was a burden that followed him through grade school, high school, and college and which almost derailed his dream of being a priest. At St. John's Seminary, where he enrolled after two years of college, there was talk among the faculty of asking him to leave. Why spend years training a priest who might not be able to preach? But then, just in time, the stutter was gone. Lennon willed himself to fluency -- though the fear, he says, may never leave. "This was something I really wanted, to be a priest, and I needed to pull myself together, and I did," said Lennon, who went on to run the seminary and is now a bishop and the interim leader of the Roman Catholic Archdiocese of Boston. "[But] I never get up there that I'm not a nervous wreck." Raw determination has fueled the rise of Richard Gerard Lennon to his present, unsought prominence. He is the humble priest without discernible ambition, who surprised his colleagues when he became a bishop and stunned them when he was tapped by Pope John Paul II to fill the void in Boston when Cardinal Bernard F. Law resigned in disgrace. Through 30 years in the clergy, Lennon's willpower, analytical bent, and capacity for hard work have helped him surpass colleagues of greater charisma or careerism and build a reputation as a man who presses past obstacles where others might stop. In Boston, he once hitched a ride on a plow so he could celebrate Mass for nuns snowbound in a hilltop cloister. In Scituate, he helped fight blazes when firefighters got injured, and he aided in the rescue of families trapped by coastal floodwaters during the Blizzard of '78. But now, the 55-year-old Lennon holds what many see as the toughest job in the US Catholic church, and many are again questioning whether he is up to the challenge. Lennon is again setting out to prove his doubters wrong. He wants to settle the legal claims brought by more than 500 people, to resolve the cases of 25 priests who are still barred from ministry pending the investigation of misconduct allegations, to square church spending with fallen revenue, and to heal the extraordinary rifts that have opened between bishops and priests and laypeople. His goals are daunting; his time, limited; and the strategy he has chosen, painful. He has angered some victims and their advocates with hardball legal tactics. He has alienated parishioners by closing schools and talking of closing parishes. And he has yet to reach out to the disenfranchised forces, including the Voice of the Faithful, the Boston Priests Forum, and many of Boston's Catholic power brokers, who believe the abuse scandal proved a need for church reform. Some are questioning whether it is possible for a man who has spent his entire career in the church of Boston, half of it as an aide to Law, to make the drastic changes needed to pull the archdiocese through this devastating crisis. "He seems to be guided by that same inner circle of advisers, lay and clerical, that were there with Law," said James E. Post, the president of Voice of the Faithful, a lay group formed last year. But his allies say Lennon is being held to an unrealistic standard, given that his is only an interim mandate. He must make the sort of tough decisions that win few friends, and which his predecessors flinched at. He seems expected to fix within months a problem that took decades to create. "It's an impossible task," said the Rev. Jack Ahern, pastor of Saint Mary of the Assumption Church in Brookline, whose rectory was Lennon's home for 10 years. "But if anyone is up to it, he probably is." Lennon says there was no single moment when he realized he wanted to be a priest. "I went to college still kind of unsure, but at the end of my first year, it became much more clear to me that this is what God was asking," he said. "They [his parents] weren't quite prepared for it. I can't say that they ever pushed the idea." Lennon was a serious boy, always deeply involved in St. James parish in Arlington, where he served as an altar boy, and where several priests inspired him with what he now describes as "the way they cheerfully, and in such a committed way, lived what they were doing." At Matignon High, a Cambridge Catholic school, Lennon was active in the sodality, a religious association. As a boy from a well-known family -- Arlington's Lennon Road was named after his grandfather -- Lennon was well-liked, a dutiful son who would mow the neighbors' lawns, a big boy who played all sports, but whose top priority was always studying. Lennon's father, Albert, was the deputy fire chief in Arlington, and there were four other firefighters in his extended family. Even after he became a priest, Richard Lennon served as fire chaplain in Scituate, kept a scanner in the rectory, and showed up at fires to help out. "I was never aware that Richie wanted to be a priest, but freshman year at BC that became his interest," said Stephen G. Surette, a classmate at Matignon and Boston College. "He definitely spoke of it as a vocation, not a career choice." The nation and the church were both undergoing dramatic social change when Lennon moved across Commonwealth Avenue, from Boston College to Saint John's Seminary, in 1967. The issue of civil rights, in particular, engaged many seminarians, who pushed to be allowed to work in Roxbury or otherwise express their support for the cause. At the same time, the Catholic Church was in the throes of the extraordinary changes set in motion by the Second Vatican Council, which ended in 1965 and triggered years of reform. Boston's seminary was divided between those who wanted an open school, so students could engage with the community they would serve, and those who thought seminarians should be sequestered. "There was a reaction against what some seminarians felt was overprotection," said historian Thomas H. O'Connor of Boston College. "They were beginning to rattle the cage." Lennon was still at BC in 1966 when 100 students at St. John's staged an extraordinary protest against Cardinal Richard J. Cushing that led first to the ouster of eight seminarians, then a rector. But such protests were only the most visible face of changes that transformed his seminary experience. "When I went in, it was very locked down, so that we had two hours on Wednesday afternoon when we could walk about the grounds, and that was it for the week," said Monsignor Paul V. Garrity of Saint Mary Church in Lynn, a seminary classmate of Lennon. "By the time I was ordained, everybody had cars." About half of Lennon's contemporaries dropped out or were thrown out of the seminary. "I myself enjoyed my six years there," Lennon said, "but that doesn't mean it was utopia, because it wasn't." But Lennon managed to dodge the major divisions of his time. Asked recently whether he had felt excited or fearful about the changing church, he chose a cautious answer, relying, as he often does, less on emotion than on his reading of church texts. "I was hopeful," he said, "but Vatican II was a very complex event in the life of the church and much of what was being written ... was very enthusiastic, but not really balanced in the sense of looking at the entirety of the teaching." Lennon's career as a priest moved steadily. After his ordination in 1973, he served parishes in Scituate and Quincy. In 1988, Law chose him to serve as chief canon law expert at the chancery, and in 1999, Law named him rector of St. John's. In 2001, the pope elevated him to auxiliary bishop, and last Dec. 13, the pope made him administrator of the archdiocese. In each post, he exhibited the traits and habits that have come to define him: a passion for order, a zeal for work and study, a basic sense of decency and generosity, a formal, serious demeanor, but a warm, unpretentious personality. Asked what his hobbies were, his high school friend, Surette, responds, "studying." But Lennon does have a few other pastimes -- he is a BC hockey fan who used to frequent games; he likes to play cribbage; he is a fan of the Stockyard restaurant in Brighton. He says the rosary daily, alternating between sets of beads from his father and his grandmother. He is notorious for his unmelodious singing voice, but enthusiastic about song; he started the children's choir in Scituate, and was such a reliable presence at recording sessions of the Daughters of St. Paul choir that they started referring to themselves as the Lennon Sisters. "He was always a bundle of energy, flying between the rectory and the church and the parish hall," recalled Robert A. Barbary of Scituate, who credits Lennon with helping revitalize his parish, St. Mary of the Nativity. "But from the crewcut on down, he was regimented." He is a man who likes things just so. For years, he traveled regularly to Arlington to see the same barber. He is a devoted customer of a tobacconist in Newton Centre, who stocks his favorite blends for his beloved pipe. He delivers his homilies without notes -- he says he has never written one down -- in direct sentences with clear logical flow. At Matignon, his major extracurricular activity was the math club, and at Boston College, he planned to major in mathematics. But at the seminary, and ever since, his favorite subject was canon law -- a dusty abstraction to some, but a joy to him. A friend, the Rev. 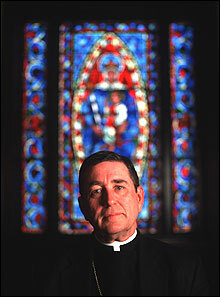 Thomas H. Maguire of St. Helen Church in Norwell, who was asked whether Lennon sided with his Scituate parish or Cardinal Humberto S. Medeiros in a dispute over affordable housing, responded simply: "He was on the side of canon law." Lennon, unlike most experts in the arcane rules that govern the church, did not train in Rome or at the Catholic University of America, but is a self-taught canonist, drawing on a personal library that now numbers 300 volumes on the subject. "In the real world you need order, so that the people in the church can all realize their vocation, their duties," Lennon said. "The church isn't just in my head -- it's reality, and when you're dealing with reality, you have to have some order. I think it was that that attracted me to canon law." Another seminary classmate, the Rev. Edmond M. Derosier, pastor of St. Anthony Church in Shirley, says canon law fits Lennon. "Richard has a very logical mind ... and if he gets an interest in something, he goes after it tooth and nail until he understands it," Derosier said. "To be perfectly honest, at times his mind is frightening. He has an incredibly disciplined approach to any issue. I'm not saying there's no passion -- he's not a robot or a computer -- but he approaches a problem by trying to view it from all the angles, and sometimes people mistake that for lack of compassion." Lennon's strong Boston accent, his hearty laugh, and his self-deprecating humor go a long way to putting people at ease, despite his 6-foot, 2-inch frame and booming voice. But there is more at work than a common touch. At various times, he has engendered a sense of loyalty and devotion in people whose lives he has affected. Take, for example, Caroline D. Reid, who was 22 when she called the rectory at Saint Mary's Church in West Quincy and said she was thinking of leaving the Protestantism of her family for the Catholic Church. Lennon took Reid under his wing, tutoring her and then presiding over her confirmation. "I had never spent any time with a Catholic priest, but he taught me to pray, he made me relaxed -- he was very comfortable and not intimidating," said Reid, now 37. Over the years since, Lennon has counseled Reid through crises, officiated at her wedding, and baptized her children. In 1994, when she had a prematurely born infant who needed major surgery, Lennon rushed to Massachusetts General Hospital because Reid wouldn't let the operation begin until her child was baptized. His gregariousness has aided him in meetings with victims of abuse. Olan Horne, a leader of a victims' group, said his discussions with Lennon reflected "a different air at the chancery. It seemed a lot more relaxed -- he was very engaging." But if Lennon's manner can be winning, his careful, almost plodding approach to problem-solving, his devotion to institutional rules and order, have fueled concerns among some that he is too much a product of the archdiocese to change it. "We need somebody who is not part of this coterie in Boston," said Roderick MacLeish Jr., a victims' attorney. "Bishop Lennon is not getting the job done." Lennon's reliance on Law's aides has caused him some awkward moments. James J. Perry, who learned from a newspaper account that his birth father might be the Rev. James D. Foley, who had an affair with his mother, was shocked when Lennon asked Perry to send him a copy of documents about Foley. Lennon told Perry he couldn't get a complete set from his own church lawyers. Lennon is no stranger to the chancery, where he worked with the cardinal, bishops, and priests who time and again chose not to punish or remove abusive priests. Lennon was never a decisionmaker on those cases, but he was aware of some of them, and his record is now being debated. "I would like to know what he did in order to protect children from pedophiles, because morally he had an obligation," said victims' attorney Mitchell Garabedian. But Lennon said it was not his job, as head of canonical affairs, to deal with miscreant priests. "I had nothing to do with priests who were misbehaving, be it sexually or otherwise," he said. "The only time that I was involved was if a canonical opinion had to be given -- for example if there were a question of jurisdiction." And he is clearly disturbed by the second-guessing. "I think it's terribly unfair, I really do," he said. "When you're in a diocese this size, because of the amount of work, out of necessity people become rather specialized. ... You're not involved in everything, you're just not." Lennon began his tenure as administrator with a bold gesture -- greeting victims and protesters outside the cathedral. But since that time, Lennon has moved into the cardinal's residence -- a building some wish he had shunned -- and he now meets visitors while sitting beneath a large oil painting of his unpopular predecessor, Law, whose portrait has replaced that of the Virgin of Guadalupe, which has been moved into an entryway. He has spent time building relationships with chancery employees, has been meeting with victims, and is planning to meet with priests and hold regional prayer services during Lent. But he has retained Law's lawyers, aides, and administrators, explaining that "they are much more knowledgeable on these areas than I am." He has not reached out to Law's critics or the archdiocese's reformist groups, and the church newspaper he publishes, The Pilot, on Friday published a column questioning the faithfulness of 58 priests who called for Law to resign. His defenders say Lennon is making the best of a no-win situation, and that he is, characteristically, unintimidated by the obstacles ahead and unconcerned about his own popularity. "He's trying to resolve the scandal of sexual abuse, and run a large and complex diocese with escalating costs and falling revenue and diminishing clergy, and it's all complicated and compounded because ... he's a temporary person," Garrity said. "I suppose the standard now is survival, and he's surviving." Conventional wisdom holds that Lennon is unlikely to keep his job -- he has too little experience and too many ties to Law's scandal-tarred administration to become archbishop of the nation's fourth largest diocese -- but conventional wisdom can be wrong. For however long he is here, Lennon says he will try to help the church he loves, a church wounded by his peers' misdeeds. "On a personal level, this has made me more focused and committed to who I am and what I'm supposed to be," he said. "Things like this were not holy, and that's a real blemish on the church that Christ gave us. It's a terrible blemish, and the church has to be called back to holiness." This story ran on page A1 of the Boston Globe on 2/16/2003.